WePay is an online payment solution that has been designed to provide the optimal payment experience for its users. It partners closely with platforms to provide fully integrated payments and risk services so users can deliver the end-to-end user experiences they want without taking on the overhead that is not wanted. WePay is a trusted partner for more than a thousand top platforms, helping make their payments as seamless, simple, and safe as possible. It provides much functionality for everything the platform needs that is related to payments in a manner that is easy and free of risk as well. WePay’s payment technologies have been designed to meet the unique payment needs of each business, no matter how complex or risky these are. Users have control over the experience, including customization options for sign-up, checkout, and email communications, as well as the opportunity to white-label the buyer and seller experience. At the same time, 3rd party redirects and lengthy merchant onboarding flows that undermine user adoption and payer checkout are avoided and fraud protection is ensured. Users get to enable payments in seconds by provisioning merchant accounts seamlessly behind the scenes without having to worry about setting up a gateway or undergoing a lengthy underwriting process. While advanced risk tools allow the system to safely accept the merchants’ other processors may have problems serving. The software handles all matters related to overhead operations, which means less worries and stress for the business. Transaction-level reporting gives users granular data about how money is moving through their platform. Every transaction is backed by WePay’s innovative risk management technology, which is effective in stopping fraud and identity theft that can cost money and user experience. It also handles the compliance with government, bank, and card network requirements, including PCI, OFAC, and other regulations. 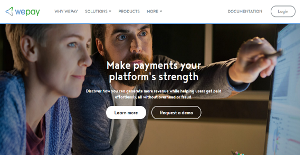 If you are interested in WePay it could also be a good idea to investigate other subcategories of Best Payment Gateway collected in our base of B2B software reviews. Every enterprise has different requirements and requires an application that can be customized for their size, kind of workers and buyers, and the specific industry they are in. For these reasons, no platform can proffer perfect tools off-the-shelf. When you look for a software product, first be sure what you want it for. Read some WePay reviews and ask yourself do you want basic functionality or do you want sophisticated features? Are there any industry-specific features that you are searching for? Find the answers to these questions to assist your search. There are plenty of aspects that you need to consider and these include your budget, specific business needs, your organization size, integration requirements etc. Take your time, try out a few free trials, and finally zero in on the app that presents all that you need to boost your company efficiency and productivity. We realize that when you make a decision to buy Payment Gateway it’s important not only to see how experts evaluate it in their reviews, but also to find out if the real people and companies that buy it are actually satisfied with the product. That’s why we’ve created our behavior-based Customer Satisfaction Algorithm™ that gathers customer reviews, comments and WePay reviews across a wide range of social media sites. The data is then presented in an easy to digest form showing how many people had positive and negative experience with WePay. With that information at hand you should be equipped to make an informed buying decision that you won’t regret. A perfect team is formed when you pair WePay with GoFundMe. A software that's uber easy to utilize and with fantastic support. The best payment system to have ever hit the market! A leap in payment processing for small businesses. A great company with a product that's so easy to use. What are WePay pricing details? What integrations are available for WePay? Pros: I like how their team works. Our account managers are known for being courteous and responsive. Even if I'm asking for things that are close to impossible, they were able to take my issue seriously. They even provided me with an alternative solution in case the current ones fail to work. WePay software has been collaborating with our team for 4 years now, and the partnerhip has been nothing but great. Cons: Although this isn't really common, I was hoping if there's a solution to effetively manage multiple payment accounts at the same time. In scenarios where customers are dealing with more than one payment account simultaneously, it can be a pain setting up withrawals and KYC for every single one. Pros: WePay is considered to be a surrogate website for today's online payment software platforms. The beneficial aspect of it all is that it requires no subscription or setup fees. There's no need to set up a merchant account, website, or do software installations. The best thing about it is being able to accumulate funds and then using them to purchase or sell tickets. It even provides you with online vouchers. Cons: WePay hasdn't really met to my standards. Customer support is constantly an issue. Their approach in resolving issues with users is more casual rather than the expected professional courtesy seen in other brands. Since WePay is solely a payment system, it doesn't really focus much in improving its speed and user-friendly aspects. A not-so-bad service that isn't as demanding. An easy-to-use tool with fantastic customer support. Implentation is quick and easy. An awesome product made by an awesome company. If you need more information about WePay or you simply have a question let us know what you need and we’ll forward your request directly to the vendor.